Product prices and availability are accurate as of 2017-03-06 11:59:30 GMT and are subject to change. Any price and availability information displayed on http://www.amazon.co.uk/ at the time of purchase will apply to the purchase of this product. The Pet Style Foldable Carrier Crate is the ideal travel accessory for any dog, cat or small animal owner. Designed to be the perfect carrier for use while travelling either in a car or public transport, our travel crate can also be used as a place of rest or for training puppies and kittens. Built with a strong steel frame, the spring loaded locking mechanism allows the carrier to be folded easily while maintaining strength when in use. Each carrier offers two mesh opening, one at the side and one at the front which closes via zips. Each carrier comes with a detachable side pocket for storing toys or treats in addition to the fixed top pocket. ACL Style Outlet exclusively manufacture and distribute the Pet Style brand and range of handy home and garden wares. We believe in useful, good quality products at affordable prices and we're certain our customer service and despatch speed cannot be beaten. If you have any questions about your order, our products or anything else please do give us a shout. Choose your favoured shipping method and all orders placed before 5pm weekdays will be despatched that very day. 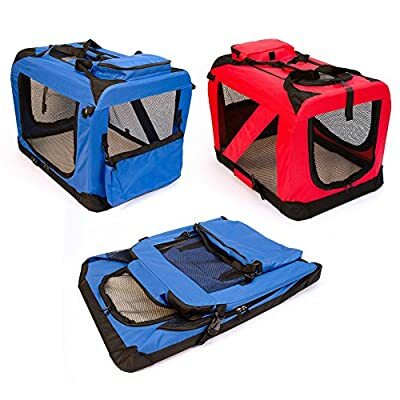 The Pet Style Travel Carrier is the ideal accessory for owners of pets large and small. Perfect for camping, a trip to the vets, holidays or to aid puppy and kitten training. Strong and sturdy with a powder coated steel frame and complete with a durable, woven fabric cover which is water resistant and hand washable. Easy to assemble and disassemble, the carrier folds down when not in use for easy storage. The fixed top pouch and removable side pocket are ideal for storing toys or treats. A padded floor mat is also included for added comfort and is removal for easy washing. The small size carrier is 49.5 x 34.5 x 35 cm, medium size carrier is 60 x 42 x 42 cm & large size carrier is 70 x 52 x 52 cm and is exclusively manufactured for ACL Style Outlet and available in Blue, Red, Beige and Pink.